One News Page United Kingdom > News Videos > "Boy Plays Outdoors With His Pet - A Mini Pig"
"Boy Plays Outdoors With His Pet - A Mini Pig"
&quot;Most of the boys that I know would love to have a dog for a pet. They like the idea of taking him or her for a walk, playing fetch with their best four-legged furry friend, or just hanging out together and basically having lots of fun! But, once they see this video, I bet most of them will change their minds. Well, check this video out, and you&rsquo;ll see what I am talking about. This video shows an adorable young boy who is playing outside with his pet - a pig! It is the most adorable mini pig I&rsquo;ve ever seen! 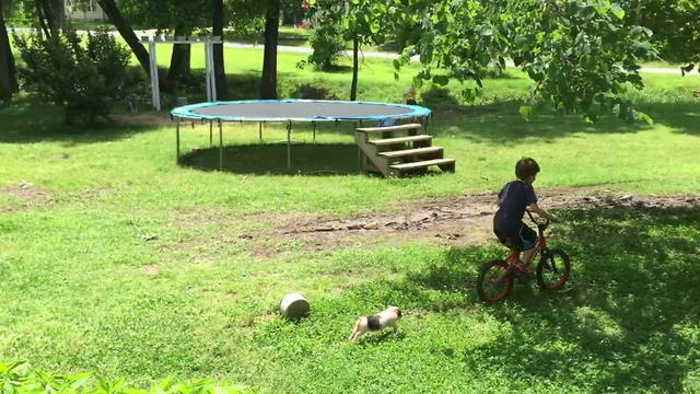 The boy is riding his bike, and this sweet, cheerful teacup pig is chasing him around!